I began sailing Optimists aged 8, then progressed through the RYA Junior and Youth system in Oppies, 420s and 29ers before sailing a 49er for 18 months or so. When I decided professional sailing wasn't for me I bought an RS800 and have raced it ever since. I also do lots of other sailing including RS200s, team racing and some yacht sailing. This year was my 6th Nationals, so it was nice to finally win, although a huge amount of credit needs to go to my new crew Fiona Hampshire! Communication! The more you talk as a pair the easier it gets. Bouncing ideas off each other is really useful! Whether it's about rig set-up, or tactics. It's especially important for boat-handling when it's windy. Emma started sailing in a Mirror with her Dad before racing Toppers and 420s. Luke’s sailing began when his family moved to Lymington – first helming Cadets then crewing in a 470. After uni we sailed a Laser 4000 for four years when it still had a fantastic UK and European circuit. We then had a sabbatical from dinghy racing while we went yacht cruising for five years. Once back home, we quickly realised we needed to get an adrenalin fix again; fortunately some friends lent us their RS800. A few capsizes later we were hooked! Weight equalised racing in a twin wire skiff that doesn't require a degree in boat handling, combined with a friendly social scene; it was everything we wanted. It has been a challenging learning curve; at our first nationals we were mid fleet but found the faster sailors were always happy to give advice, and five years later we found ourselves at the front. - Practice boat handling on flat water and don't worry when it gets tricky in chop; everyone’s in the same situation. - The RS800 is gloriously forgiving downwind but upwind Luke the helm needs to focus on steering, so Emma as crew doing tactics on the beat makes a big difference for us. - Club racing is good practice, particularly for those tricky two-sail reaches. - Keep fit to avoid injury and so you can enjoy the last race of the day. 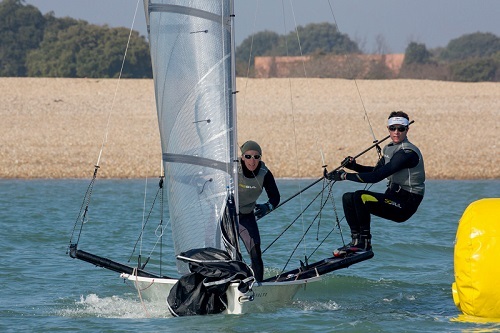 - Don't take it too seriously: the RS800 events are about having fun on and off the water. - Race an RS800 at Garda at least once in your life!